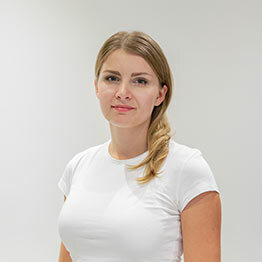 Yulia was born in Ukraine and graduated from the National Aviation University with a Master’s degree in Mechanical Engineering but she always had a passion to travel and work in customer-focused roles and be part of a team. She worked for a 5-star luxury hotel in Ukraine and has lived in Russia, China and the UAE, both in Ras al Khaimah and now Abu Dhabi. As a child, she was surrounded by farm animals from cows to rabbits. She had fish, hamsters and cats as pets (not all at the same time). 14 years ago, she fostered a kitten (Tosha) who is with her mom in Ukraine and she’s delighted to have recently adopted another cat from GVC! Sharing positive energy with people and pets is what Yulia loves about working at GVC. She says the passion and energy of each person she’s working with pushes her to make a difference and aim higher. Apart from animals, Yulia loves to travel and explore different cultures, cuisines, traditions. She also likes spending time with her family and friends outdoors whether it’s a barbeque, park or beach.